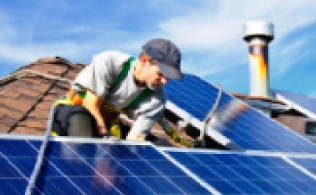 Photo Voltaic, or PV, is a slightly newer technology than solar thermal and the principles are simple. PV modules utilise free light energy from the sun - not heat - to generate DC curr ent. This means that the PV panels will continue to generate electricity even on cloudy days. 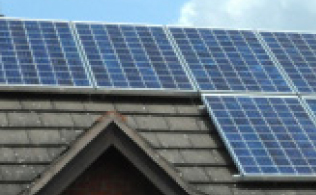 A reaction generates electrical current within the panels (which again are usually found on the roof of a building) and this electricity can then be used in the home to power appliances which have traditionally been solely reliant on the national grid and its fossil fuels. The idea behind a typical domestic installation is to cover the "base load". This covers appliances such as fridges, low level lighting and any other low demand but constant draws. It is not designed to cover all electrical demands such as kettles, irons etc as they have high power requirements and would require much larger PV installations. Most households would normally install just enough to cover the basics and the national grid would then pick up the excess and peak demands. 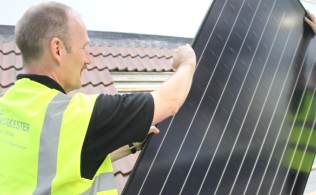 The Government has launched a scheme that offers clean energy cash back (via what is to be known as the Feed in Tariff to householders who generate their own electricity which will be based on what is sold back to the national grid.